FINISH STRONG and get a QUICK START in the next 45 days as you create a dream map and personalized training plan that fast tracks your top goals! The Breakthru to Inspired U Sprint is a done-with-you online training and personal coaching program that helps you finish your #1 goal from creation to completion in 45 days or less (from Nov. 9 – Dec. 23). Imagine what it would feel like crossing the finish line of your life WITHOUT REGRETS! You lived a full life. You prioritized your loved ones. You left a lasting legacy around your highest contribution. Every moment of your life matters. Is TIME getting in your way? 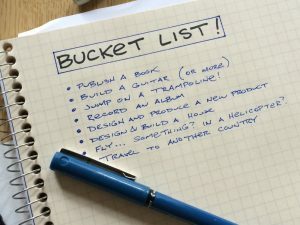 Do you have a life goal on your bucket list that you want to check off, yet feel you are too overwhelmed to get started? Is there a big dream you keep putting on the back burner because you’re just too busy? In a recent survey that I conducted – TIME – not having enough hours in the day is the BIGGEST CHALLENGE and GREATEST OBSTACLE to living an engaged life and achieving meaningful goals. It’s also that ONE THING that will help us have that BIG BREAK we are looking for. 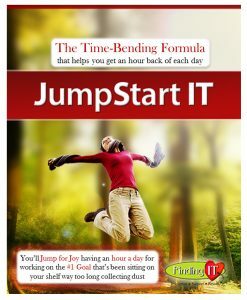 In my FREE JumpStart IT Report, I introduce a time-bending formula that gives you a hour back of your day, every day! If you have read it yet, you won’t want to miss it! Just click on the report to receive it. 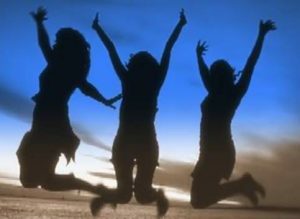 Then jump for joy having an hour a day for working on the #1 goal that’s been sitting on your shelf too long collecting dust! My husband John and I made an agreement. After spending nearly a decade at home with my three young sons, it was time to either make what he refers to as “my expensive hobby” (aka my lifestyle business) profitable like a real business or get a real job. I was determined to make this happen and had less than a year to do it before my last son would be in school full time. I either had to make it BIG or make my way back to corporate. So I put myself out there BIG time and put my dreams to the test. Would I be able to hook something and make a BIG catch? First, I revived my Inspired Women’s Retreat – a popular event that I hosted when I just started my business – in hopes of reconnecting with these inspired women. It was a smashing success on the outside – a full house of engaged women who helped us raise nearly $2,000 for a nonprofit organization. Yet what no one knew is that it was a major blow to me – I lost money on the event and sold the least amount of my products ever – at my own event! Soon I would find out the winners from the Transformational Author’s International Writing and Publishing contest that I had entered. This was my next big catch. My hopes were high as the past two years I was one of the top winners. This year I went all out! I even entered two proposals, increasing my chances to win the top prize, which is an agent. When I scrolled down the list of winners and didn’t see my name, I thought for sure it was a mistake. After double-checking it and realizing that I didn’t even win one of the other 25 “pity” prizes, I was devastated. What happened?! While this crushed my spirit, I had one opportunity left to crush it. This was it! And this was it. 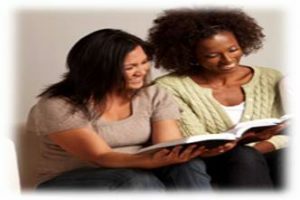 I was part of the inner circle for a women-of-faith group that was planning for years on hosting a big conference. Helping from the ground up, I was thrilled to be one of the three speakers to kick off their first conference ever with 1,000 women attending. Along with my speaking debut, I was going to launch my newest product Love Affair with God a 4-years-in-the-making personal and spiritual transformational experience that includes my e-book, companion guide and videos. Thrilled to be sharing my calling, two days before the event I got a call. The call. The call that changed everything. I got my BIG break all right – a BIG breakdown when the leaders regretfully asked me to step down from the event because of a last-minute values conflict. STRIKE THREE and I was OUT! OUT of dreams, OUT of hope, totally down and OUT. All my dreams were dead and my heart was shattered. It took me months to recover and uncover what God wanted me to do next. Then it took me many more months after that to have the courage to rise again and put my heart back out there. This breakdown allowed me the time I needed to break down what it really takes to have a breakthrough and be your best inspired U. Maybe all that happened to me wasn’t about the achieving the end product (my BIG catch), but what I’ve learned about the process of pursuing our dreams along the way. This is exactly what I’ve done. I’ve spent the past 20 years through intense study learning how to help all of us have a break through to being our best inspired selves — how to bring our deepest desires and greatest aspirations to life. I’ve created a blueprint that integrates the things that matter most in our lives and how you can intentionally live them out on a daily basis. When we have a SYSTEM and strategy for going from where we are to where we want to be, we can get there EASILY, more EFFECTIVELY and more EFFORTLESSLY. I’ve spent thousands of hours, thousands of dollars and thousands of ideas for developing this signature sprint technique designed JUST FOR YOU!! It’s my life’s work and is the “best of the best” from all that I’ve learned and mastered these past two decades. I’ve studied with some of the greatest mentors, teachers and role models teaching personal transformation, professional success, spiritual growth and Christian living. 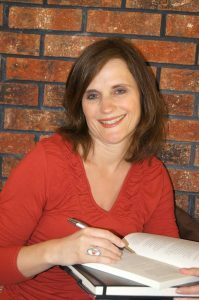 My Master’s Degree is in creating and delivering exceptional learning programs. 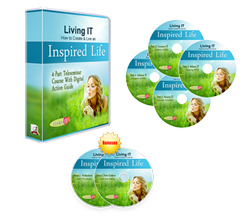 I’ve brought it all together as an integrative and highly inspirational way of living that will transform your life! It’s packaged in a way that will allow for immediate application in your life. I’ve done the hard work for you, now you just need to do the heart work! Bottom line: The only person you can change is YOU. The only person you can control is YOU. We have to stop the excuse that we don’t have the time to make the difference we really want to make in our lives. None of us have enough time, energy or money to get done in a day or our lifetime that we really want to. Yet isn’t it about TIME that you really, REALLY try to invest in something – YOU – that is with you 24/7 with so much untapped potential just waiting to make a difference? YOU are your most important asset, your greatest liability and your best investment. It’s time to say NO MORE! Are you ready? holding off on my true destiny! Like most things in life, you get out what you put in. So, if you are serious about your top goals and living without regrets — I’m serious about working with you. It’s also time to say YES for a life-transforming breakthrough. 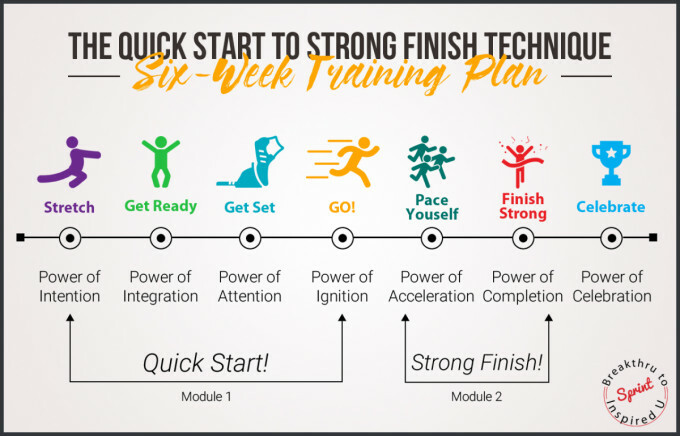 When you join the program, you get access to Quick Start to Strong Finish Technique, which is a highly interactive and intensive 6-week training plan for having a systematic and strategic approach for manifesting your dreams, for completing your most important goal from creation to completion, in 45 days or less! Each day for 45 days through video training, I’ll be teaching ONE brief, easy-to-digest segment around ONE extremely important concept for you to immediately implement. You’ll have a clear daily exercise plan. You won’t get confused as it’ll be ONE concept with ONE exercise on ONE page that is moving you closer to your ONE most important goal. This is what I call the “One is Won method”! When you focus on only ONE main thing and ONE thing each day to move you closer, you’ve just WON half the battle of getting there. 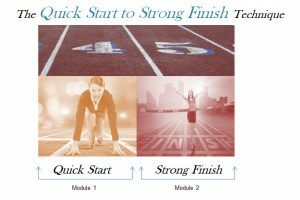 Using this approach you’ll complete two modules in this sprint. You’ll get off to a QUICK START during the first part of the program (first 4 weeks) as we’ll cover everything you need to have in place so that when you are ready to go, so you can explode into action with incredible speed and strength toward your goal. You’ll FINISH STRONG the second half (last 2 weeks) of the program. This is a DONE WITH YOU program. That means that TOGETHER we’ll make this happen, both going all in and giving it our best! You’ll receive a personalized training plan as we connect personally each week during the 6 weeks for a heart-to-heart check-in on your progress and then do laser coaching to determine your next best steps. These weekly ½ hour personal coaching sessions are invaluable in making sure you stay motivated and on track. Another great way to get even more feedback and coaching from me is through email. You’ll have UNLIMITED email access to me each week Monday – Friday during the 45 days. This is a great opportunity for you to run ideas by me, ask questions, seek encouragement or whatever else you need to keep on sprinting toward completing your #1 goal. I’ll also be emailing YOU as I receive insights and ideas around you and your goal. And watch out, I’m inspired often! Another great aspect of this program is to learn from your fellow sprinters during our weekly office hours and live virtual 1/2-hour Q&A sessions. Each week I’ll schedule the sessions at two different times (over lunch and evenings) to give you the best chance to attend live to one or both of them. If you can’t, no worries as they will be recorded for you to listen to later. This is a great opportunity to learn from and work with your fellow classmates (aka dreamers, sprinters). You can use this as a chance to brainstorm and receive feedback from each other. This is also the place that you can ask me about anything in the program. Either you’ll get your questions answered directly from me on the spot or you’ll get “side coaching” as you observe the mistakes and successes others are making when they are in the hot seat. This partner will go above and beyond just holding you accountable, they will be critical in helping you breakthrough to your most inspired you. Since the highest level of learning is to teaching back what you learn, I’ll be teaching you how you’ll do this with your partner so that you can ensure that you are maximizing everything you are learning and internalizing it for the future. You can train at the pace that is right for you. For each exercise that you’ll complete, you’ll chose which level that is best for you. Just like investing in your financial future, depending on your stage of life and financial experience, you decide how you want to invest (conservative, moderate, aggressive). The same goes here. Depending on how seasoned of a “runner” you are, you can choose the appropriate exercise using the “1-2-3 Choose What’s Best for Me” approach. Using the Quick Start to Strong Finish Technique, you’ll have a six-week training plan developed for you to sprint for 45 days. Week 1) Using the Power of Intention, you’ll STRETCH past your limiting beliefs and propel yourself toward your most important life dreams. You’ll define and conquer your empowering story, the first of the three steps to a breakthrough according to master motivator Tony Robbins. You’ll create your dream map, your #1 goal mission, and your future gold-medal self! Week 2) You’ll take your top intention, your #1 goal, and realistically figure out how you can accomplish it into your current life through the Power of Integration. GET READY because you’ll learn how to become a master time blocker and naysayer to anything that doesn’t related to achieving this life goal. How to deal with obstacles and resistance will be covered to help you along the way. You’ll elevate your mental state, the second of the three steps to a breakthrough. Week 3) By picking the best breakthrough strategy, you’ll GET SET to focus like you never have before and hone into the Power of Attention. You’ll explore different strategies, the last of the three steps to a breakthrough, and pick the best one to focus on. Based on this strategy, you’ll know the most direct route and will lock it in so you have no chance of veering from your course. Week 4) After all this focused preparation you’ll explode into decisive action through the Power of Ignition as you make great strides on your plan. It’s GO time! You’ll jump out of the starting blocks and jump into decisive action as you get started, one foot after the other to keep your unstoppable momentum going. You’ll see your progress as it will finally be much more tangible and visible. Week 5) With the Power of Acceleration, you’ll activate strategies for resistance and obstacles to keep up your great pace. Now that you’re in the race, you’ll learn how to PACE YOURSELF. Increasing your speed and endurance will be key as you get closer to the end result. You’ll activate strategies for resistance that you’ll experience during this “messy middle” part of the race and fine tune your strategies to reach the end. Week 6) Through the Power of Completion you’ll embrace the do-whatever-it-takes mentality to FINISH STRONG as as you get closer each day to breaking through the finish line. Keeping your intensity will be crucial. You’ll be both exhausted and elated at what you just accomplished! During the last four days, the class will come together to celebrate and show off each other’s gold, silver and bronze medals that they earned during this 45-day sprint. You’ll proudly hold in your hands the important goal achievement that hangs around your neck, your MISSION ACCOMPLISHED. It will be a time of recognition and celebration for all the significant progress you made and the lessons learned during this sprint. You’ll be able to look forward to the rest and recovery that lies ahead before you choose to endure another sprint, knowing how much easier it’ll be because that this next time you’ll be in much better shape. 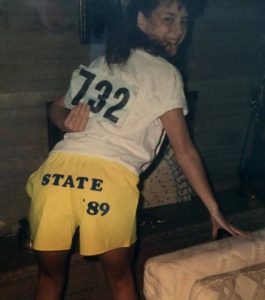 I’ve been sprinting toward my life goals and big dreams ever since I can remember. I still hold ALL of the track records in elementary school and high school for the 50-yard dash, 100 & 200 meters. Having a quick start was the secret to being a track star back then and it is the same now. In fact, being a QUICK START is the #1 way that I fascinate others according to the Fascination assessment by Sally Hogshead. I couple my inventive solutions with urgent deadlines to get things done and make things happen. 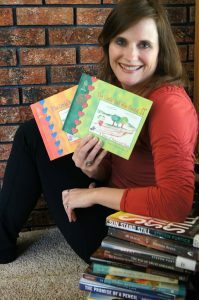 By age 30 my big dreams were to start my own lifestyle business, graduate with my Masters Degree in Training and Development and publish my first book. I spent the next decade of my life starting and prioritizing my family which I’m blessed to have three sons – Gavin (12), Grant (10) and Garrett (7), who keep me running (along with my husband John) as I help them pursue their own dreams. I’ve both developed and used this Breakthru to Inspired U Sprint technique for years to achieve my life goal of creating and completing dozens of meaningful products and programs dedicated to loved ones. My SUPERPOWER is to be that spark of inspiration that inspires and transforms people’s hearts bringing to life their deepest desires so that they can live life to the fullest! I am deeply committed to supporting YOU to live a regret-free life. You will not regret investing your financial resources into this program as the return on your investment when you achieve your #1 Life Goal is truly priceless, not only to you but to all the other lives you touch. There is a cost for this program. Either it will be the cost of inaction for not taking the time to invest in your personal transformation or it will cost you $. For the first-time as I launch this course, the investment is $497. Register HERE for the program investment of $497. CLICK the START button below. Register HERE for TWO PAYMENT OPTION of $275. CLICK the START button below. I’m offering some BONUSES that you won’t want to miss out on for registering! The value of these more than double the cost of the program. Besides a VIP 1/2 day strategy integration session with me, you’ll receive three of my top home-study programs. I’ll be also offering some surprise bonuses throughout the course to keep you motivated and having fun! Notice the title of this course is Can’t Live Without IT. IT is the “one thing” I believe any person can’t live without: a one-page, written mission, vision and values (MVV) statement about yourself and what matters most to you. 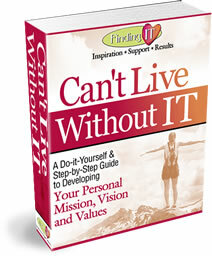 You will feel both empowered and powerful by officially documenting your own personal MVV. I believe so strongly in value of a personal MVV, for bringing you the clarity you need to live a balance and purposeful life! This comprehensive course is a digital guide with actionable templates designed as a do-it-yourself and step-by-step format with fill-the-the blank formulas and personal samples of MVV statements. Just as it’s important to get in your best physical shape, it’s just as important to be in your best inspired shape so that you will have the boundless energy that you need to keep racing after your goals. This video-based training program will look at the top five areas that you need to “work it” so that you can keep coming back for more. This signature course is one you won’t want to miss if you desire to make a plan for what matters most and take the intentional action needed to achieve the integrated life you desire. 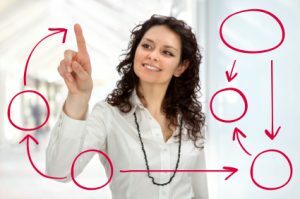 This program gives you a proven process to envision and create a way to take charge of your life from both a long-term and short-term perspective. 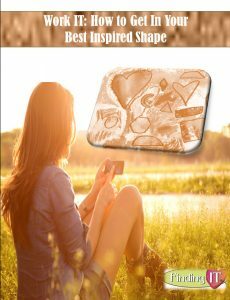 You’ll create a master plan for your life, a life planning process or system to help you develop the structure or blueprint, that you need to design your ideal, inspired life! The program includes a download action guide with templates, inspirational audio presentations to guide you through the process and extra bonus presentations from masters in the field. You’ll have the opportunity to keep on working with me after the 45-day sprint to ensure your momentum and plan for using this process to keep moving ahead. Together we’ll maximize your time and plot out the next strategy to sprint for your goals. With a 1-to-1 format, we’ll fast-track all the obstacles getting in your way so that you can continue to achieve the things that matter most in your work and life. I have a “you can’t fail” results-based guarantee. During the Breakthru to Inspired U Sprint, we have a no dreamer left behind policy. This program is a culmination of my life’s work and I’ve worked hard to create a transformational learning experience for your life that be uniquely personalized to achieve your goals. If you do the work agreed upon in this timeframe, ask for help when you need it and take my advice, you can’t fail because you can keep sprinting with me (at no extra cost) until mission accomplished. The deadline to register is Nov. 8 – yes, the same day as all the election races – when registration officially closes. Don’t forget about you getting into the race of your life. Don’t just watch from the sidelines as other people run toward their dreams. It’s time to get started now. You are only one click away from being your best inspired self! Register HERE for the program tuition of $497. CLICK the START button below. I hope that you’ll be dashing with me toward your dreams! From my heart to yours, be love! p.s. As I mentioned, one of my lifetime goals is to dedicate each product or program to a loved one. 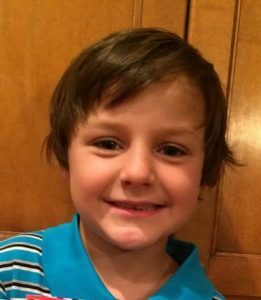 This one is dedicated for my youngest son, Garrett. At age 7 he is sprinting toward his goals with the same intensity I had as a child. I knew this was the case when he had his first track race (1/2 mile) in gym and took it so seriously that he set the goal on his own that he wanted to have the best time in first grade. When he found out his time got beat, his initial reaction to me was “Mom, my life is ruined.” (Can I say FLASHBACK to how I use to react!) Even though he overreacted to what happened, I love how he cared so much about his goals. He set his next one to do even better next time. p.s.s You are never too young or too old to go for your dreams. And once you learn how to sprint toward your goals, like my young son, you’ll never be the same!